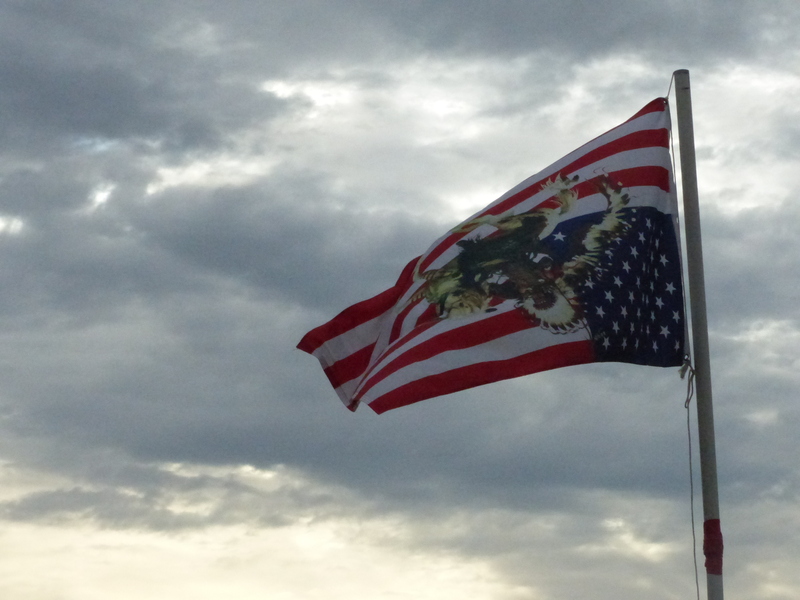 At the Oceti Sakowin Camp last year, many had U.S. flags flying upside down, an officially recognized signal of distress. The federal government is giving water protectors less than three weeks to clear out their camps due to concerns the Cannon Ball River will flood the camp during the spring melt. Meanwhile, strategic differences among Dakota Access Pipeline (DAPL) opponents threatens the cohesion of the movement. The Standing Rock Sioux Nation will continue its fight in court and is organizing a March on Washington but has asked water protectors to decamp. Other groups, including the Sacred Stones Camp and a veterans group, vow to continue to have a physical presence opposing DAPL. In the story Federal government moves to close protest camps, the Bismarck Tribune reported Friday that the U.S. Army Corps of Engineers has given notice to the camps that they have to clear off the federal land by Feb. 22. The Oceti Sakowin camp is being closed in anticipation of flooding that could cause injury and environmental damage, according to the corps. … The notices are unrelated to the Army’s ongoing full review and analysis of the pipeline easement, according to the corps. Tactical Disagreements Among DAPL Opposition: How Will it Affect the Movement? The Standing Rock Nation voted in January to close the water protectors camps. (See earlier blog.) While Standing Rock is pursuing legal challenges to the project, other groups continue to state their intention to keep a physical presence opposing the pipeline. Veterans Stand, a group of vets who have vowed to protect the pipeline protesters of the Standing Rock Sioux Nation and supporters, ominously threatened the possibility of more “boots on the ground” at the site — but also repeated their commitment to nonviolent action. The group is capable of calling up several thousand veterans to the protest site. However, what will Veterans Stand respond to the Standing Rock Nation’s request to stand down? Similarly, the Sacred Stones Camp put out a call Jan. 31 saying “We need your help,” asking people to come if they could. Their call is complicated by the fact that their camp is on Standing Rock Reservation land and from what is available in the media, it does not appear Standing Rock leaders would support this action. On Wednesday, Feb. 1, a separate group of water protectors tried to set up a new camp, the Last Child Camp, on higher ground (and on private land). Their action was met with the immediate arrest of 76 people, including Chase Iron Eyes, lead counsel for the Lakota Peoples Law Project. It was an effort to claim treaty rights under what is known as the “Unceded Territory.” He is been charged not only with criminal trespass but inciting a riot, according to the Bismarck Tribune article. Also arrested was Jenni Monet, an Indian Country Media Network journalist who said she got trapped in the crowd. She, too, is being charged with trespass and engaging in a riot, according to Indian Country Today. The Facebook Page for the Standing Rock Sioux Nation announced Wednesday that leaders are in the early stages of a March on Washington, tentatively set for Friday, March 10. Check back with the Facebook page for details.